Dehua Pei, Charles H. Kimberly Professor in the Department of Chemistry and Biochemistry, was named the university’s 2017 Innovator of the Year on March 6 at the Office of Research’s annual State of Research Address. 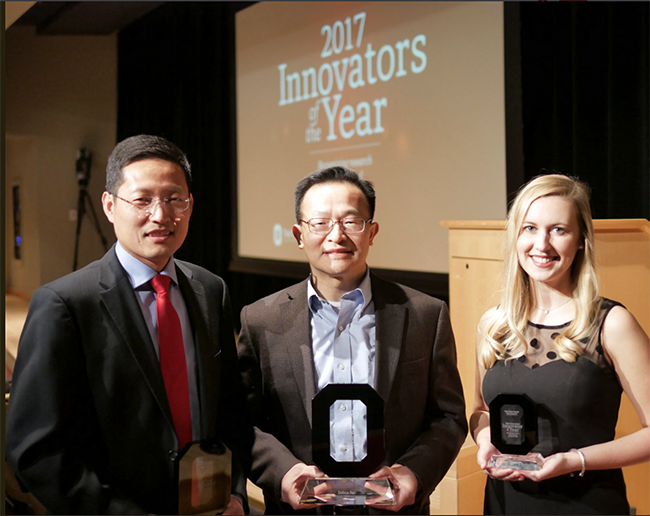 The Innovator of the Year award is given to an Ohio State researcher who is “actively working to promote commercialization of intellectual property.” This certainly describes Pei, whose work has led to 11 patent applications in the past five years, with six additional applications in progress. His research largely focuses on protein-protein interactions, which play a role in a multitude of human diseases but are extremely difficult to target with drugs. Pei’s research has helped develop several breakthrough technologies that are “poised to transform the drug discovery process and make most of these undruggable targets druggable,” said Randy Moses, interim senior vice president for research, while presenting Pei’s award. Of significant importance is the discovery of a family of small cyclic peptides that are exceptionally potent in cell-penetrating, capable of delivering all major drug modalities — from small molecules to large nucleic acids — into the cell with unprecedented efficiencies. "This award is a recognition of the hard work of my entire team, which includes all members of my research group, as well as our collaborators at Ohio State and elsewhere," Pei said. It shows [my] young students that they can actually make a difference and help solve even the most difficult scientific problems." The award was presented in conjunction with the Early Career Innovator of the Year and Next Generation Innovator of the Year awards. Yizhou Dong, assistant professor of pharmaceutics and pharmaceutical chemistry, was named the 2017 Early Career Innovator of the Year for his groundbreaking work on gene-editing technologies and the development of novel gene therapies for patients with debilitating clotting deficiencies originating in the liver. Laura McLaughlin, a fourth-year nursing student, was named the 2017 Next Generation Innovator of the Year for developing an app called BabyTalk, which supports and informs new and expectant parents — specifically those in populations at high-risk for infant mortality — on topics such as women’s health, pregnancy and child development.